Infrared imagery from NASA's Aqua satellite showed the location of the strongest storms in reborn Tropical Storm Leslie is it moved through the Central North Atlantic Ocean. Subtropical Storm Leslie formed in the Central North Atlantic Ocean on Sept. 23. It faded out on Sept. 25 but was reborn as a Subtropical storm on Sept. 28. Since then, it has transitioned into a warm-core, tropical storm. Infrared satellite data captured at 2:10 a.m. EDT (0610 UTC) on Oct. 1 from the Moderate Resolution Imaging Spectroradiometer or MODIS instrument aboard NASA's Aqua satellite revealed strongest storms with the coldest cloud top temperatures northwest of Leslie's center. MODIS found coldest cloud tops had temperatures near minus 63 degrees Fahrenheit (minus 53 degrees Celsius). NASA research has found that cloud top temperatures that cold have the capability to generate heavy rainfall. 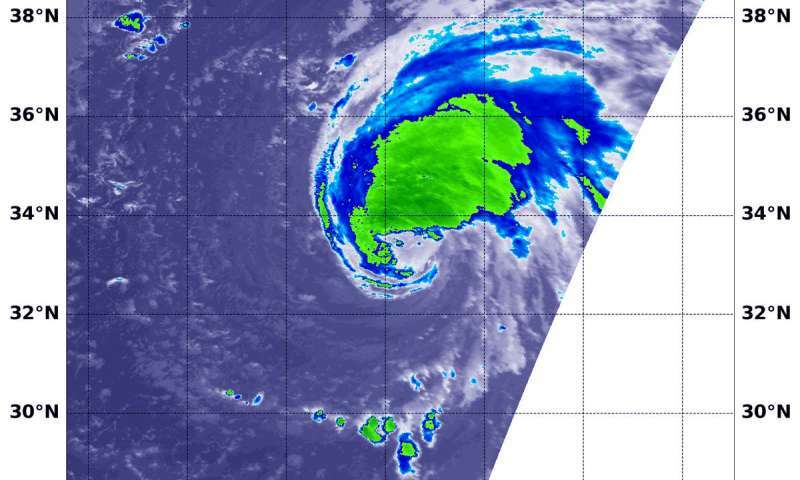 At 11 a.m. EDT, the National Hurricane Center or NHC noted, "Leslie is gradually becoming better organized. A large band of deep convection exists on the west side of the circulation and some fragmented bands are beginning to form on the east side. Overall, Leslie appears more symmetric than it has been during the past couple of days due to a decrease in wind shear." At 11 a.m. (1500 UTC), on Oct. 1 the center of Tropical Storm Leslie was located near latitude 33.2 degrees north and longitude 54.3 degrees west. That's about 615 miles (85 km) east of Bermuda. Leslie is moving toward the west-southwest near 5 mph (7 kph). A slow southwestward or southward motion is forecast during the next few days. Maximum sustained winds are near 60 mph (95 km/h) with higher gusts. The National Hurricane Center said, "Gradual strengthening is expected during the next 48 hours, and Leslie is forecast to become a hurricane on Tuesday (Oct. 2)."